The aforementioned six dimensions of health have been widely adapted and adopted, for example by WHO 2006 as part of it is promotion of a health systems approach to improving quality of care. However, it is important to note that there is a large range of dimensions some of which may have greater or lesser relevance in a given situation. 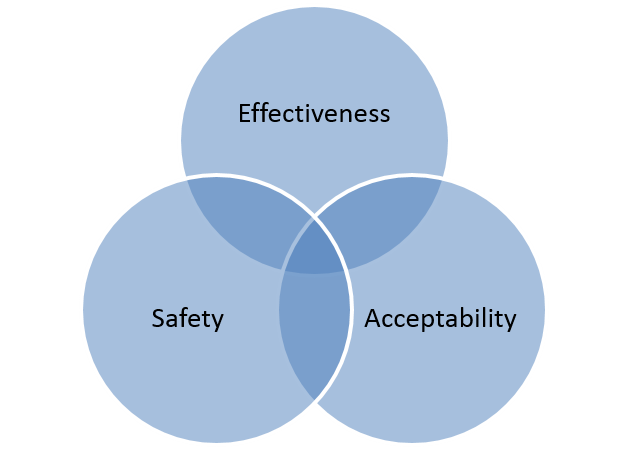 Some, such as Godlee 2009, have promoted a simple approach focused on three dimensions of effectiveness, safety and acceptability to the user of the health service as outlined in Figure 2.3. Interpersonal relations / communications A two-way street where both user and provider are able to speak and are listened to and both are able to fully understand what the other is trying to say. Performance according to standards Explicit, measurable definitions of how healthcare should be performed. Reflection: What interplay can you identify between safety and the other key dimensions of quality, for example efficiency? These two dimensions, like many others, are inter-related, In order to be truly efficient a health care system has to be safe: an unsafe system will result in even more service users seeking care due to treatment-related (iatrogenic) complications. These complications may even be the result of inefficiencies within the system and will eventually lead to increased costs and decreased efficiency across the health care service.